TROY — Fort Loramie coach Carla Siegel surpassed 400 career wins earlier this season and has led one of the most steadily successful programs in the state for the last 20 years. That consistent success has led to the program earning a lot of high tournament seeds in the last two decades, and the Redskins did again on Sunday. Fort Loramie was voted the No. 1 seed by coaches in the Sidney Division IV sectional and will start tournament play next month as an overwhelming favorite to earn another district berth. The Redskins (19-1), which are ranked No. 1 in Division IV in the Associated Press state poll, have advanced to district games seven out of the last eight years. They’ll begin tournament play on Feb 19 against No. 13 seed Mississinawa Valley and with a win will face either No. 9 Triad or No. 10 Fairlawn in a sectional semifinal on Feb. 19. No. 4 Mechanicsburg is the likely sectional final opponent on Feb. 27. Xenia Legacy Christian (17-2) was voted the No. 2 seed. The Knights are a newcomer to Sidney after being assigned to the sectional by the OHSAA Southwest District Athletic Board this season. Legacy Christian placed itself in the sectional’s bottom bracket after Fort Loramie went into the top bracket. Russia (11-8) earned the No. 3 seed and also went into the top bracket. The Raiders will open tournament play on Feb. 20 against Lehman Catholic (8-9), which was voted the No. 6 seed. The Russia/Lehman winner will face No. 7 Botkins (9-9) on Feb. 23. Houston (8-12) earned the No. 5 seed, and coach Brad Allen placed the team in a first-round game against Legacy Christian. The teams will face off on Feb. 20, with the winner advancing to face No. 8 Riverside (9-7). The winner of the second-round game will face Russia, Lehman or Botkins in a sectional final on Feb. 27. Jackson Center (1-19) earned the No. 11 seed and will face Mechanicsburg (12-7) on Feb. 19. The winner will face No. 12 Ansonia (2-17) on Feb. 12. All games in the sectional will be played at Sidney High School. Anna earned the No. 3 seed and Versailles earned the No. 4 seed in the Covington Division III sectional, and the two teams are on a collision course for a sectional final. There are three brackets in the sectional, and two were claimed by No. 1 Waynesville and No. 2 West Liberty-Salem by the time the Rockets (15-4) were called. Anna coach Jeff Maurer placed Anna in the bottom side of the Covington 2 bracket, and Versailles coach Jacki Stonebraker put her squad in the top half of the bracket. Anna will open sectional play on Feb. 14 against No. 17 Dixie (4-17) and if victorious will face the winner of No. 9 Milton Union vs. No. 10 Greenon on Feb. 21. Versailles (14-5) will face No. 16 Urbana in a first-round game on Feb. 14 and if victorious will face No. 20 Springfield Northeastern on Feb. 21. Two victories by each Anna and Versailles would mean a rematch of a close regular-season contest in a sectional final on Feb. 25. Ella Doseck hit a buzzer beater to lift Anna to a 35-34 victory over the Tigers in a nonconference game on Dec. 27 in Versailles. All games will be at Covington High School. Sidney (0-19) was voted the No. 19 seed out of 19 teams in the Dayton Division I sectional. The Yellow Jackets will likely face state-ranked and No. 1 seed Centerville (19-1) in a sectional semifinal on Feb. 20 at Troy High School. The Elks will face No. 16 Stebbins in a first-round game on Feb. 16 in Troy and if victorious will advance to face the Yellow Jackets. Complete brackets for all area teams’ sectionals will be published in the Feb. 13 edition of the Sidney Daily News. They can also be found online at SWDAB.org. 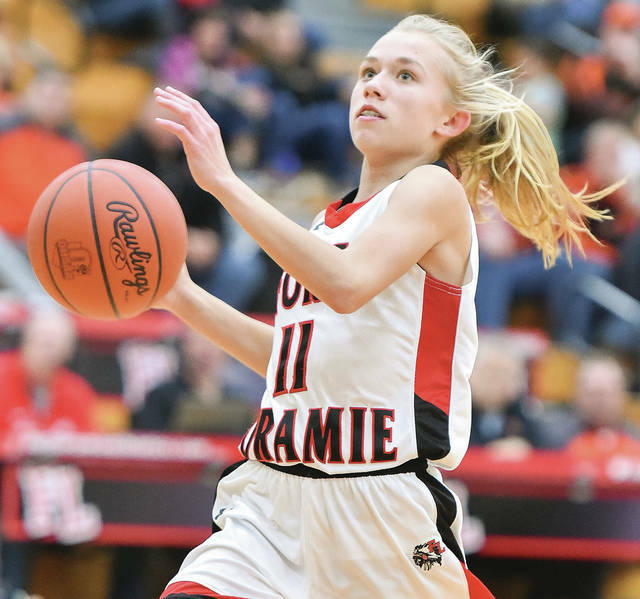 Fort Loramie sophomore guard Caitlyn Gasson goes for a layup after a steal during a nonconference game on Saturday in Fort Loramie. https://www.sidneydailynews.com/wp-content/uploads/sites/47/2019/02/web1_DSC_1618-Edit_ne20181222182341986_ne20192419443858-1.jpgFort Loramie sophomore guard Caitlyn Gasson goes for a layup after a steal during a nonconference game on Saturday in Fort Loramie. This entry was tagged Anna, basketball, Botkins, bracket, brackets, Division I, Division III, Division IV, Fairlawn, Fort Loramie, girls, girls basketball, high school, hoops, Houston, Jackson Center, Lehman, Lehman Catholic, Redskins, Riverside, Russia, sectional, Sectionals, seed, seeds, Sidney, tournament draw, versailles. Bookmark the permalink.